The Physician Leadership Journal welcomes articles about health care leadership topics. Articles spotlight original research, operational interventions and findings, and discussions that orient readers to important topics. We seek original articles that advance the scope and practice of leadership. Articles may not be under consideration for publication elsewhere, nor published previously. Careers: The journey of a physician leader throughout his or her clinical and/or executive maturation. Communication: Strategies to convey meaning from one entity or group to another. Finance: Dealing with the operational aspect of budgeting and planning as a physician leader. Health Care Organizations: The organizational role of the physician leader within health care systems. Health Care Professionals: The role of the physician leader within clinical practice. Health Law and Policy: Current or past policy issues or topics influencing physician leadership. Innovation: The use of novel and creative methods to enhance the role or capabilities of leaders. Leadership: Tactics to develop and/or enrich a leader’s ability to guide individuals and teams. 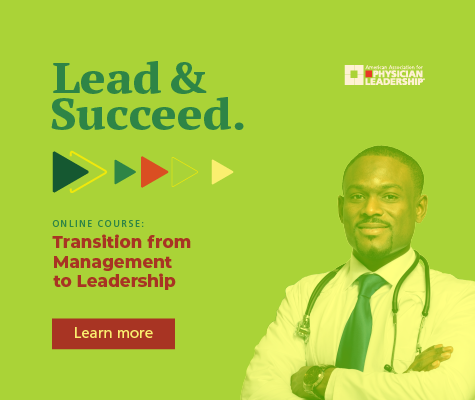 Management: Pertaining to the administration of any organization as a physician leader. Patient Care and Quality: The scientific improvement of quality and patient safety for physician leaders. Technology: Tools and technologies influencing leadership. MANUSCRIPT SUBMISSION: Articles must be submitted via email to editor@physicianleaders.org. Be sure to indicate which competency your manuscript addresses, and the submission type of your manuscript. The file (Word document) should include a cover page with the suggested title of the article, the names of the authors in the order they are to appear, the authors’ degrees and professional affiliations, and complete contact information for all authors. All text, references, figures and tables should be in one double-spaced document (1-inch margins, 12-point type). Use subheads to organize the article and break up large amounts of text. References, figures and tables should be at the end of the document. ABSTRACTS: Please provide an abstract — a summary — of no more than 250 words for the submission. PERMISSION: Obtain written permission from the copyright holder (usually the publisher) to reproduce previously published material. All letters of permission must accompany the manuscript upon submission. TABLES: Tables should be numbered and titled, cited in numerical order in the manuscript. Spell out any abbreviations used in the table’s footnote section. Tables must be included as editable components of the manuscript file, placed at the end of the manuscript. FIGURES: All figures (charts, graphs, screenshots, etc.) must be numbered and have legends. All figures cited must be in numerical order in the manuscript. Figures should be editable (in native file format) when possible. SUBMISSION TYPES: All submissions must be structured using one of three formats. A clear description and literature support of problem. A clear description of experimental methodology. A clear description of results. A clear description of the implications. A limit of 15 double-spaced pages (not including title page and references). Journal article: 3. Silber JH, Bellini LM, Shea, JA, et al. Patient Safety Outcomes Under Flexible and Standard Resident Duty-Hour Rules. N Engl J Med. 2019; 380:905-914. Newspaper article: 9. Armour S. Health-care spending Projected to accelerate as population ages. Wall Street Journal. Feb. 20, 2019. Website: 12. A good meeting needs a clear decision-making process. Harvard Business Review; https://hbr.org/2019/03/a-good-meeting-needs-a-clear-decision-making-process. Accessed March 11, 2019. FUNDING: If research was funded by a granting agency, include the information on a separate page of your file. QUESTIONS: Send questions about submissions to editor@physicianleaders.org. Send questions about the rest of the PLJ to journal@physicianleaders.org.